The purpose of this research is to determine if there are any improvements in a person’s spoken English grammar, after completing a Compton P-ESL program. This is being done by tabulating the number of grammar errors that clients produce when they “make up” a sentence for each of 66 words that are a part of a standardized assessment, done at the beginning of their course. The same assessment is done at the end of their course, thus allowing for a comparison with the number of grammar errors produced in their “made up” sentences at the end of their course. To date we have compiled date for 14 clients and will be adding at least 6 more to establish a reliable data sample. Preliminary results suggest some very striking differences, and this initial phase of the study should be completed by the end of April, 2012 and will be submitted for presentation at the American Speech and Hearing Association meeting in 2013..
Other variable being examined are the types of grammar errors produced, comparisons of average before/after sentence length, semantic similarities and differences in the types of sentences made up for the same words at the beginning and end of the course and, no doubt, many other questions that will arise, as we get further along with the project. The purpose of this project is to determine if there are any improvements in a person’s listening comprehension of spoken English after completing a Compton P-ESL program. I am currently evaluating the reliability and “acceptability” of the various listening comprehension tests that are currently available, and which are most widely used. The next step will be to administer a pre and post comprehension test, tabulate the results and statistical analyses. I will welcome speaking with any P-ESL certified speech pathologists who are interested in participating. 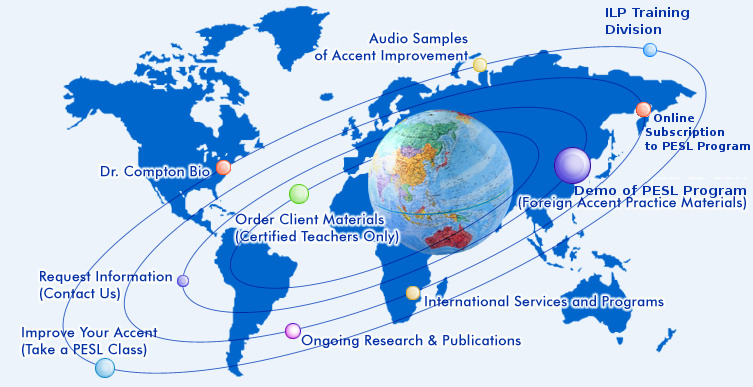 The purpose of this research is to determine if there is a significant difference in speaking improvement for clients using the CD-ROM vs. the online practice materials. We already have some data showing a very positive difference in favor of the online program. However, I want a large data base of at least 100 to 150 clients from at least 15 or 20 language backgrounds who have used the online program. I will welcome speaking with any P-ESL certified speech pathologists who are interested in participating. 4. A Longitudinal Study of the Evolution and Speech and Language Development of Young Children. This research is a revisit of a study initiated approximately 25 years age, and is based on the new computer analyses technologies and possibilities made during the past 10 years. This research involves analyzing the speech and language developmental data of Children from 1 yr. to 4 yrs which includes thousands of ongoing speech samples collected from 6 children during this period of their development. Will the speaking improvement gains that clients achieve dissipate over time after completing a P-ESL program? No, not at least up to 5 years. b) Years in USA? No. d) Male vs. female? No. f) Client vs. company pays? No. g) Learned English in USA vs. home country? No. Are there differences in the perceived “degree of accent” of an individual depending on the native language of the speaker and the listener, i.e., does the “degree” or “strength”of one’s accent reside in the mouth of the talker or the ears of the beholder? a) initial consonants vs. final consonants? Compton, A.J. Foreign Accent Norms of American English for 47 of the Worlds Languages, Carousel House, San Francisco, CA, Rev.Ed. (2009) (The publication documents and provides normative date for the accented sounds of American English and constitutes the most comprehensive compilation of foreign accent ever undertaken).